An ecological imbalance is brewing in Bangalore district because farmers, who have hit upon desperate times, are seeking desperate measures. Driven by drought, farmers here have taken to digging, washing and sieving the topsoil of their farms for sand. They sell it to the ever-growing construction industry which is unable to meet its demand from riverbed sand alone. Farmers have thus hit upon a cash crop, but at what cost. During the past three to four years villages around Bangalore have been excavating surface soils from tank beds, agricultural fields and common lands to produce a kind of artificial sand to supply nearly 4000 truckloads everyday to construction projects in the metropolis. 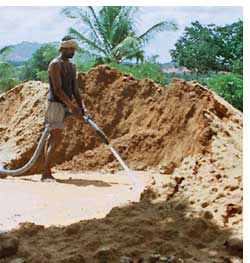 Around 25 per cent of the sand required is extracted from agricultural fields and village tank beds; the remaining 75 per cent is mined from riverbeds. There is 10-50 per cent loss of productivity of the soils that could take 8-10 years to get revived, stated a study. Titled "Sand Extraction from Agricultural Fields around Bangalore Ecological Disaster or Economic Boon", the paper was written by Rajendra Hegde, S C Ramesh Kumar, K S Anil Kumar, S Srinivas, and V Ramamurthy from the National Bureau of Soil Survey and Land Use Planning, Bangalore. It was published in Current Science (25 July 2008). Just a little away from Bangalore's swanky new airport, in Karahalli and Mayasandra villages the ragi and coconut cultivation lands are interspersed with deep cavities. These cater like pits serve as filtration units in Devanhalli, Chikkbalapur, Ramnagaram and Kolar taluks of Bangalore district. Rectangular pits are dug out with a slight slant where the washed waste is let out. They are set up near bore wells. Surface soils are excavated and spread on the extraction pit. Two to three rounds of washing is done to extract the sand. Nearly 132,000 litres of water is needed to wash one truckload of sand, the study found. This means nearly 7.95 million litres of water is used for sand extraction annually. In most of these parts groundwater has reached precarious levels, the study pointed out, as a result of which all the open wells have dried up. Farmer Krishnappa S of village Karahalli said he made Rs 1500 for every truckload of filter sand. On most days two truckloads left his farm. "There is a scarcity in Bangalore for sand. It is easier to get gold here than mud,'' said Krishnappa. He is among the prosperous few who have their own trucks. Poor farmers either sell their soil for as little as Rs 50 per tractor-trolley or work as labourers in extraction units. 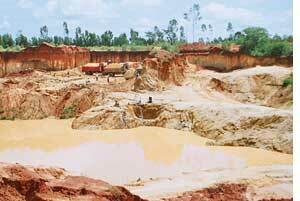 Last November the police and officials of the department of mines and geology (domg) cracked down on sand mining from agriculture land and booked 44 cases in Bangalore district. Sand extraction is permitted only from riverbeds in blocks notified by the department. "We are however getting reports of not only riverbed sand mining going on clandestinely but also top soil excavation all around Bangalore," said Justice Santosh Hegde of Lokayukta, the public watchdog body. In the face of drought for the past seven years and the growing market for sand there is need for a policy rethink, said Hegde. The feasibility of topsoil excavation has to be examined. Scientifically, if it is found okay, domg then has to give clearance. "However, soil should not be excavated near any public place and after the operations it needs to be closed. The tendency is to deplete natural resources and run," the Justice said.